SINGAPORE (Feb 6): Oil prices edged up on Monday on fears that new U.S. sanctions against Iran could be extended to start affecting crude supplies, but markets were capped by further signs of growing U.S. production. Tensions between Tehran and Washington have risen since a recent Iranian ballistic missile test which prompted U.S. President Donald Trump's administration to impose sanctions on individuals and entities linked to the Revolutionary Guards. Brent crude futures, the international benchmark for oil prices, were trading at $56.86 per barrel at 0037 GMT, up 5 cents from their last close. 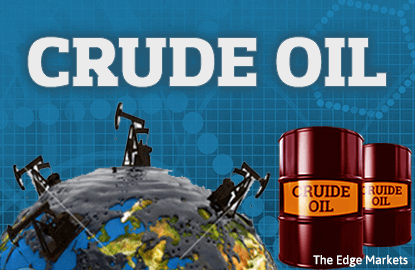 U.S. West Texas Intermediate (WTI) futures were up 5 cents at $53.88 a barrel. Traders said the strain between Tehran and the United States raised concerns that U.S. sanctions could be tightened further to impact Iranian oil exports, which were only allowed to return to normal last year. "The move by the U.S. to impose new restrictions on Iran for testing a ballistic missile ... does raise the risk of further tensions disrupting supply," ANZ bank said on Monday. "This was countered somewhat by data showing another strong rise in rig activity in the U.S.," it added. U.S. energy companies added oil rigs for a 13th week in the last 14, extending a nine-month recovery as drillers take advantage of crude prices that have held mostly over $50 a barrel since OPEC agreed to cut supplies in late November. Drillers added 17 oil rigs in the week to Feb. 3, bringing the total count up to 583, the most since October 2015, energy services firm Baker Hughes Inc said on Friday. The rising U.S. production, led by shale drillers, dims efforts led by the Organization of the Petroleum Exporting Countries (OPEC) and other producers like Russia to end global oversupply by cutting their output by a planned average of almost 1.8 million barrels per day (bpd) during the first half of the year. OPEC's efforts to shield its biggest and fastest growing markets in Asia from the cuts are also undermining a rebalancing of the market, traders have said, as OPEC cuts exports to regions in Europe and North America where demand growth is slower or where other suppliers are more dominant. Caution over efforts so far to re-balance the market is reflected in price movements this year.